Watch previous episodes of AMA and email a question to us and we’ll try to get it into the next AMA. Do not miss the incredible sale this weekend on digital back issues of Skeptic magazine via pocketmags.com or print back issues via shop.skeptic.com. 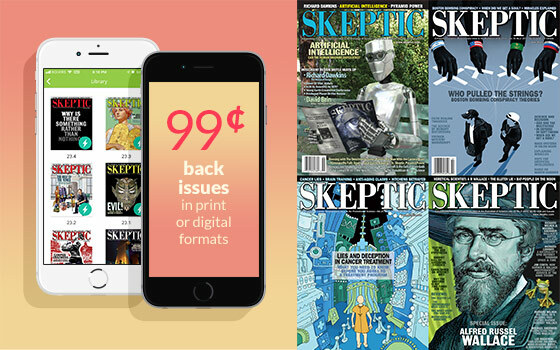 For 3 days only, all print and digital back issues of Skeptic magazine are on sale for the ridiculously low price of 99¢ each! Now is the best time to complete your collection! Your digital purchase(s) on pocketmags.com can be synchronized to your favourite Apple or Android device(s), or read on your PC or Mac.